Three goals in the first 25 minutes laid the foundation for a convincing Annan victory against bottom of the table Albion Rovers who appeared all at sea in the first half but in a vastly improved second half Albion posed far more of a threat against an Annan team which appeared to be going through the motions and lacked any real invention to add to their first half tally until substitute Ross Ferguson scored an 88th minute goal to complete the scoring. Annan came out of the blocks and inside 6 minutes Christian Nade’s header from Chris Johnston’s cross found the feet of Peter Watson who scored with a low central shot into the bottom right hand corner of the net which gave Morrison no chance. 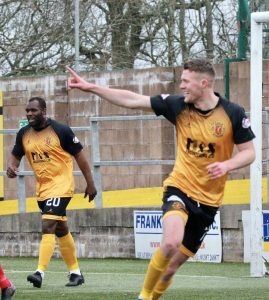 It was the perfect start for Annan and it was to get better, Christian Nade won a free kick 22yards out but Chris Johnston’s effort failed to hit the target. Johnston was on fire and in the 15th minute the Annan winger’s effort was cleared from the goal line. The Albion goal was surviving a cherished life but moments later Tony Wallace’s right footed shot into the corner of the net from a Lewis Strapp pass gave Annan a two goal lead. Albion were struggling to get to grips with Annan’s crisp play. Johnston then made a penetrating run ending with an effort which was scrambled clear and then Moxon had a good effort saved by Morrison. It was a purple patch that Annan were enjoying. It was all one way traffic at this stage and when Steven Swinglehurst headed Annan into a three goal lead after he connected with Chris Johnston’s free kick in the 25th minute there appeared no way back for the Albion. Annan continued to take the game to Albion and Swinglehurst was presented with an opportunity in the 29th minute when his effort went close but the effort went narrowly past the post. Albion found it very difficult to get near the Annan goal and the one way traffic continued. Scott Hooper dinked in an inviting ball into the danger area which Swinglehurst only just failed to connect with then David Wilson sent a powerful header over the bar from a Johnston corner in the 35th minute. Albions efforts on target were rare but in the 38th minute Brian Ross tried his luck but the efforts went high never troubling Mitchell. If the first half was all one way traffic the second half saw Albion become more of a force and for large spells in the game the visitors pinned Annan back. Tony Wallace had the ball in the net in the 64thminute but the goal was correctly ruled out for offside. Michell was then forced to pull off an important save tipping Ben Reilly’s effort over the bar. Minutes later Mitchell once again came to Annan’s rescue when he pushed Reilly’s effort round the post. It was the closest Albion came to breaking the deadlock and as the half approached the closing stages Annan started to impose their authority back on the match and Ross Ferguson scrambled the ball over the line in the 88th minute to conclude the scoring.